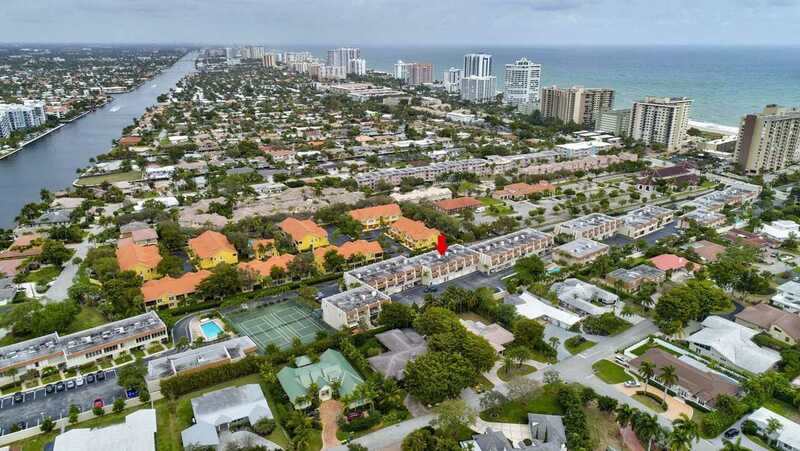 On A1A between Intracoastal and Ocean, this 3 level townhome has beach access. It is directly across the street from Sea Watch Restaurant. It's close to restaurants, shopping and nightlife. This townhouse has soaring ceilings, 2 master suites, tile floors in the living area, formal dining room. Kitchen has granite countertops with breakfast bar and built-in buffet. Great fenced patio for BBQs. Covered balcony off master overlooking community and another balcony off living area. Community has 3 pools, tennis courts, clubhouse with exercise room, shuffleboard and docks on the Intracoastal. DUES INCLUDE Cable, Internet, Water, Sewer, Trash Etc Only bill for you would be FPL! (And home phone, if you still want one) Owner is offering $5,000 towards Buyer's closing costs or DUES! SchoolsClick map icons below to view information for schools near 5555 N Ocean Boulevard #56 Lauderdale By The Sea, FL 33308.